Mon.-Thu. 11 a.m.-9 p.m.; Fri.-Sat. 11 a.m.-9:30 p.m.
A cold night calls for a warm meal, and Jamaican restaurants deliver on a number of fronts. 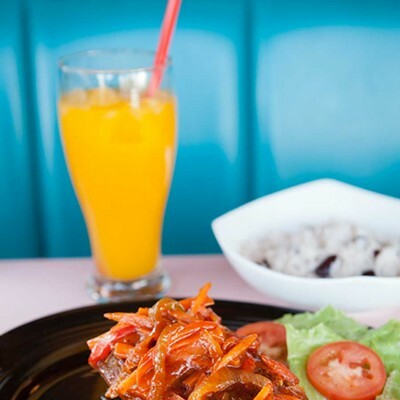 The island vibe evokes sunny beaches; jerk chicken can usually be counted upon to be plenty hot; and Jamaican restaurateurs, in our experience, are pros at the warm welcome. 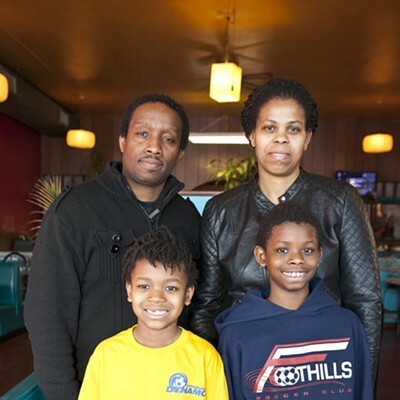 At Caribéana, in a little strip mall in Penn Hills, chef/co-owner/server Donette Howell-Wright's welcome went beyond greeting us when we entered, beyond even introducing herself. She asked our names, too (including our kids') as we ordered. She then used them as the meal proceeded — to deliver each dish to the one who'd ordered it, to politely ask an inattentive child to make way for a plate and to inquire of each of us by name whether we were pleased with our food. And the answer, roundly, was yes. 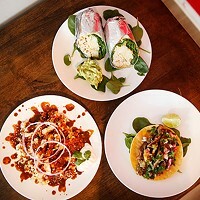 Though a couple items were unavailable on a quiet Tuesday night, there were plenty of options on the menu to satisfy a hungry family of four. Because it was cooked to order, our food did not arrive promptly. But Donette let us know that would be the case when we ordered, and we weren't in a rush, so it was OK. We were comfortable in the dining room, which had the not-unpleasant vibe of a 1970s rec room, with potted palm plants, an aquarium and walls painted bold crimson where they weren't covered with paneling. A mirror-backed bar that looked like it dated from about the same era as the paneling served as a place for Donette's kids to hang out, doing homework and playing games, while their mom tended her business. 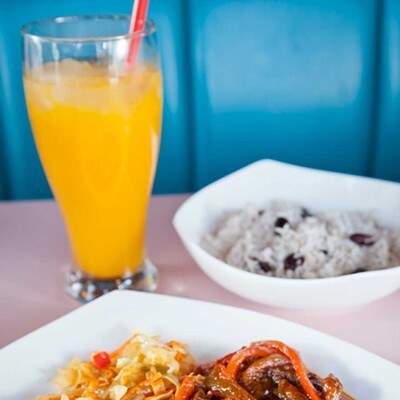 Two iconic Jamaican dishes, fried plantains and jerk chicken, were the first we ordered. The plantain rounds were fried up nice and crispy, not at all dried out, and came with a tasty, sweet-hot sort of pepper jam to enliven their native starchiness. 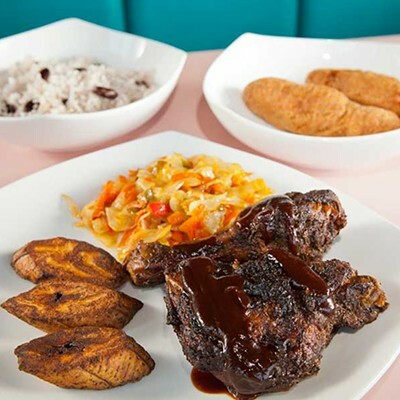 Caribéana's version of jerk chicken included a spicy black rub paired with a deep mahogany sauce. While the two seemed to share the same array of earthy spices, the interplay between their different flavors was delightful, the rub offering serious, peppery heat while the thick sauce provided a subtly sweet counterpoint. Beneath the jerk, the drumstick and thigh were moist and fall-apart tender. For the spice-averse, "brown stew chicken" was an ideal order. More meltingly tender chicken was deeply seasoned and lavishly sauced with tomato-sweet pepper gravy, but not a bit piquant. The "brown" in the name refers not only to the color of the gravy, but to the preparation of the chicken: It's marinated, then browned in a pan before being simmered in the stew. 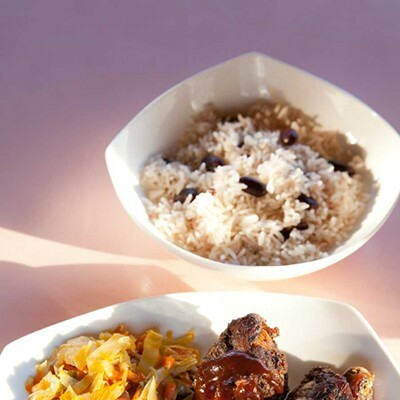 Garlic, onion, salt and pepper rounded out a flavor profile that was both comfortingly familiar — owing to its common ingredients — and uniquely Jamaican — served over rice and beans. Oxtail stew was actually simmered in the same gravy, but this meat resulted in a different marriage of protein and sauce, so that the beef stew became something deeper, darker and more intensely savory than the chicken. The bone-in beef tails required some careful fork-and-knife work, but the rich, supple meat was more than worth the effort. Rice and beans were again on the plate to soak up excess sauce. Each entrée was accompanied by steamed cabbage, but instead of a limp mound of pale green leaves, it was a lovely mélange of both pale- and dark-green shredded cabbage combined with carrots. The texture was tender, but not insipid: The carrots had been expertly cooked so that they weren't distractingly crunchier than the leaves, and the flavor was straightforward yet satisfying. Banana fritters are fittingly mentioned last, as their sweetness pushed them into dessert territory, at least by American standards. But their banana flavor was strong and true. 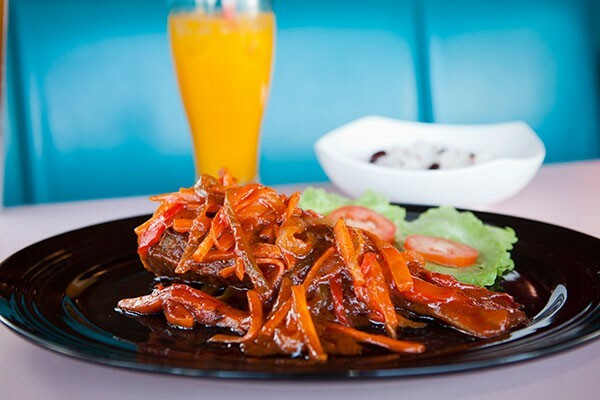 A significant section of Caribéana's menu that we did not try was seafood. 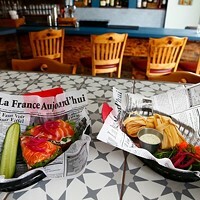 Several seafood dishes are on offer, including curry shrimp, jerk shrimp, red snapper and tilapia; the latter can be had steamed or escovitch style, in which the fish is marinated and fried in a peppery vinaigrette. When we come back in warmer weather, we'll definitely order that. 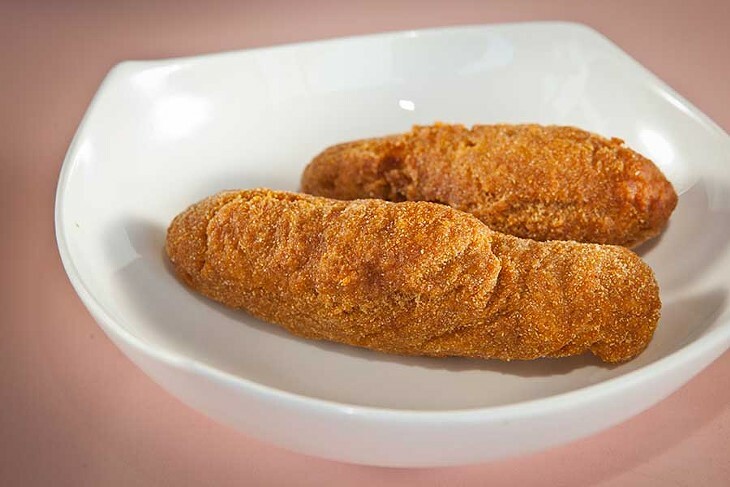 On this visit, we relished Caribéana's provision of a different kind of comfort food for cold winter nights. Those ultra-tender meats and savory, seasoned gravies really hit the spot.